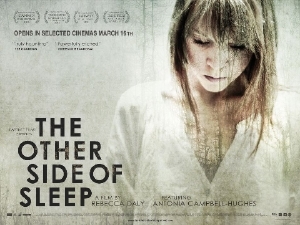 A trailer has finally emerged for Rebecca Daly's The Other Side of Sleep, a thoughtful mystery thriller with an edge that was selected for Cannes 2011. It is receiving an Irish theatrical run shortly. The film stars Antonia Campbell-Hughes who period drama fans may recall from Bright Star or Albert Nobbs. One morning Arlene wakes in the woods beside the body of a young woman. Someone watches from the trees. The body is soon discovered and suspicion spreads through the community. Increasingly drawn to the girl's family - her grieving sister and accused boyfriend, Arlene barricades herself in at night, afraid to sleep. Haunted by grief buried and delayed, Arlene's sleeping and waking realities soon blur. And all this time someone is watching her.